Kennedy Street have now opened up their wait list for their free community connections programme – An introduction to social enterprise. Scoping out their community project idea? Building a business for good idea? Setting up a not for profit community project? Connecting with other amazing people in the community who want to make a difference? Community Works are starting new, monthly one-to-one advice surgeries at their offices in Community Base, for groups working in Brighton & Hove. If you want to talk over an issue, or just ask for general advice, they can support you with a wide range of topics. These include, but aren’t limited to Funding, Monitoring and Evaluation, Governance, Volunteering, Policies and Procedures, Strategy and Planning. The sessions are free but you do need to book a place. The one-to-one advice surgeries are for anyone working or volunteering within a Brighton & Hove charity or community group. Members of Community Works will get priority. If your organisation isn’t a member, please get in touch with Community Works to discuss how you can join. Contact info@bhcommunityworks.org.uk or call 01273 234023 to book a 30 minute slot. This training is run by Brighton and Hove Food Partnership. Do you volunteer or work for a community group or organisation that involves food, such as a surplus food project, lunch club, food bank or community garden? Places are limited to two people per organisation although if you have more please let us know and we will put them on a waiting list. What to bring: A form of ID, pen, paper and enthusiasm. We will provide tea, coffee and refreshments but please bring your own lunch. At the end of the day there will be a short examination. Please arrive by 9:15 in order for a prompt 9:30 start. Pedal your way to tasty, healthy snacks with our new smoothie bike! 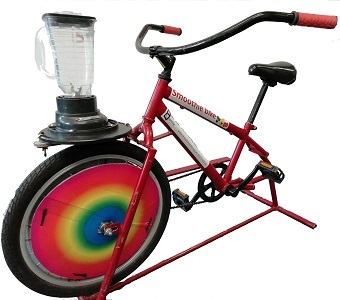 Now available to hire, our “fender blender” is suitable for children aged 6 – 14. It will be great for fetes and fairs and allows children to create a delicious fruit smoothie using the power of their own pedalling. Have you got a community based project that needs funding? This event is for community groups and organisations in Brighton & Hove who are interested in crowdfunding. Come along with your ideas for the chance to work through your project plans and find out more about how Crowdfunding could work for you. You’ll also hear about the Projects that Matter Campaign that we’re running with the CriSeren Foundation and how you could be one of the 5 local causes to receive £1,000 towards your first crowdfunding ask. The workshop will be run by Crowdfunder.co.uk the #1 community crowdfunding platform, having raised over £60m for business, charity and social enterprise projects across the UK. Places are limited so please book your spot early. Places are allocated on a first come first served basis. Please notify the organiser if there are any adjustments you require in order to participate fully at the event, and we will do our best to meet those requirements where possible. Resource Centre support work with volunteer run community groups in East Brighton area has almost doubled in the last year. Our latest report to East Brighton Trust shows that we have continued to provide essential support with our Accounts Examination and Design & Print service. In addition, demand for one-to-one support and consultancy, in all aspects of running a group, has more than doubled. It has been inspiring to see so many new groups, run entirely by local people, emerging and finding their feet over the last year. This adds to the many groups that continue to do what they do so well, understanding the needs of their community and taking action to support local people and bring them together. We provided 56 one-to-one support sessions (compared to 22 in the previous year) to 20 different groups. Seven of these groups are either new or had never used the Resource Centre before. Collectively, they help and improve the wellbeing of a wide range of local people from ‘the cradle to the grave’ and lots of people in between. They help improve the local woods, parks and outdoor spaces; provide lunches for children, families and older people; organise events that are free to local people; provide art and dance activities; run community buildings; investigate local history; create newsletters; and provide a hub where local people can come together to build networks and friendships. We supported groups to draft constitutions, policies and procedures; think about legal structures and report to the Charity Commission; keep their accounts and prepare their budgets; improve their communication and use of social media; apply for funding and evaluate their projects. All the groups we support are run by local volunteers for local people. Those involved have a commitment to their community and a vision of how they can improve it. But often they have no experience in running a group and need to develop lots of new skills to do it effectively. In our support sessions we work with people in a way that they feel comfortable. We ask them how they run their groups, what things they find difficult and get an understanding of their confidence levels and skills. We then help them to move forward in a way that suits them and their group, working good practice into their existing systems. We ask groups for feedback after each package of support is completed. Out of 16 requests for feedback we received 11 responses. All of those who responded said the support they received was excellent, they felt more confident and their group would be able to work better as a result. We carried out 17 Accounts Examinations for 16 different groups. This provides groups with an accurate summary of their accounts to share with members and funders. It also gives Treasurers the opportunity to check the procedures they are using and get some advice and support if they need it. We received feedback cards from 69% of these groups. They all said the service was excellent. We did 26 different design and print jobs for ten different groups. This included production of newsletters, flyers and posters. We would like to thank East Brighton Trust for supporting this work with a grant of £3,000. This grant supports just under half the work done in 2018, with the remainder (£3,130) being funded from Resource Centre reserves. 9th January, 6th February, 6th March, 3rd April, 1st May, 5th June, 3rd July, 7th August, 4th September, 2nd October, 6th November, 4th December. Email Emma on emmareeves@trustdevcom.org.uk for more information.